Bed is gorgeous. It’s a little darker in person but is still amazing. Took my husband and I about an hour to build. The Marcella Collection by Jennifer Taylor Home is the perfect addition to any bedroom looking to add a bit of a traditional to contemporary flair. The headboard and footboard are both hand tufted and accented with a row of hand applied nail heads along the borders including the inside panels of the wings themselves. The classic style and charm of the Marcella upholstered bed is an ideal choice for your master suite or even the guestroom. Dimensions 67.0 In. X 88.0 In. X 56.0 In. Gorgeous Bed delivery to Florida was much quicker than 4 weeks. Looks just as beautiful as in the pictures. Highly recommend looks much more expensive than it is. Absolutely gorgeous! It arrived faster than I was anticipating and is very nice quality. It was fast and easy to assemble. I ordered a 9" box spring and 14" mattress. This was far too high. Your best bet is to not exceed 18" or 19" in total height. I ended up reordering a low profile 4" box spring to go with the 14" mattress and I have about an inch left before it is too high for the bed. Ha funny how they want us to write a review when it’s been over a month now we haven’t gotten the shipment or item. We do not know exactly who to blame but if this is not resolved, I’m not buying on this website again. 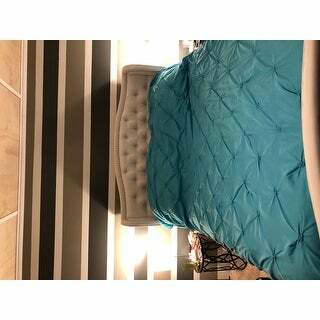 This is a very beautiful Bed and we are loving it and very High quality product , its completely worth with this price. I looks so awesome with the color of Family room. and other best part is time to time update on delivery and very very quick deliver, what it says it fulfills about timing wise, Spoke with CS team and they are also very knowledgeable and provide accurate information not only that they also do followup by email and delivery update comes as TEXT message along with email , This is big item and delivery of this item as says 4 to 6 weeks but it came in just 2 weeks and also when i called to CS they followed up in few hours and made sure i have proper update and it got delivered on time, thank you so overstock . Love, love, love my new bed. It’s elegant and perfect. I love the color and the detail of the bed. It’s the perfect height too in my opinion. Was easy to put together, but would definitely recommend having a second set of hands to help and go faster. Highly recommend! I haven’t had the chance to remove the bed from the box yet due being in between a move. However, it appears to be what the ordered. The Overstock staff was diligent in resolving any issues presented during the shipping process. Overall pleased at this point. I love this bed. It is so elegant and beautiful. It is a little darker in person than in the picture, but I think it ended up looking better. The material is soft and the headboard is very comfortable. Also, it was very easy to piece together. I did it all by myself in an hour. Absolutely LOVE this bed! Exacty as pictured. Shipping & delivery was quite a struggle but due to freight company it was subbed out too! Highly recommend purchase! Love the color and the fabric. Great bed for the price. Look elegant and comfortable , The color look like the website , the price is fair and matching my furniture I will order one more for my kids room. love this bed. very high quality. color matched our expections. no odor from packaging. easy to assemble. just expect this to be delivered by a truck instead of your local office. Very nice bed, really love how it looks. "What does the fabric feel like? I want something soft like velvet "
The fabric is velvet and is very soft. "For a queen bed, what height mattress and box spring would you recommend?" It is recommended to have a combined height of at least 15 inches for both the box spring and the mattress. I hope it helps. Was shopping for an upholstered bed for quite sometime & this one met all our needs! Can’t wait to see it all put together & decorated. Will write about review after. "What height mattress and box spring would you recommend?" "Can slats be used instead of box spring?" A box spring is recommended however you can use a mattress directly on the slats if desired. "Can this frame be used with a tempurpedic adjustable bed.....the mattress top and bottom moves....."
Yes, this can accommodate an adjustable base. When assembling the product, just do not install the slats that support the box spring and mattress so you can use the bed with an adjustable base. "What color is the bed blue"